alaTest on kerännyt ja analysoinut 865 arvostelut lehdistä ja verkkosivustoilta. The ASUS MeMO Pad is a low-cost, 7in Android tablet that will sell for $50 less than the Nexus 7 when it launches Down Under in "early March". Comfy grip. The ASUS Memo Pad on the left, the LG Optimus G on the right. 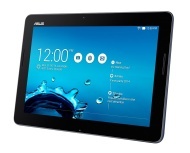 Asus MeMO Pad is a basic 7-inch (1024x600 pixels) Android tablet with a 1GHz processor, Wi-Fi connectivity, 1.3-megapixel front-facing camera, 8 or 16 GB of built-in storage that can be further expanded with microSD cards.